Superbly conditioned fairways and lush Bermuda greens have made this 27-hole layout an all-time favorite among both visitors and resident golfers. Several holes feature strategically placed island and peninsula greens. However, the course is not overly difficult, making it enjoyable for all golfers. 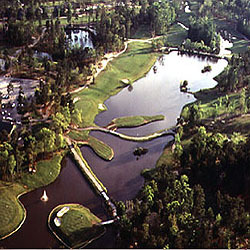 Island Green is built upon gently rolling terrain accented with an abundance of azaleas and dogwoods. It is conveniently located off of Hwy. 707 near Surfside and Garden City.